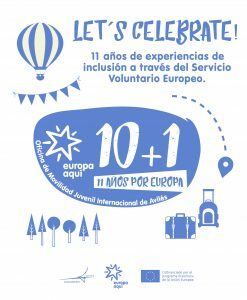 An international seminar about the European Volunteer Service called “Let’s Celebrate” has been organized in Avilés, Spain, in October 2017. This seminar aimed to create an opportunity for international EVS coordinator to exchange experiences and reflexions about the EVS and study the outcomes for the youngster from an inclusion perspective. Eurocircle, along with 20 other participants from 11 European countries, joined this seminar to share the experience gained throughout the years but also to collect new ideas and practices. Altogether, the participants created a check-list and a guide to reinforce the inclusion in mobility projects and provide good practices to other organizations working in mobility. This seminar gave the opportunity for the participants to meet with current and former volunteers through several events like the intercultural night. During this night each participant shared food, culture and information about its country with the young from Avilés. Volunteers were involved in the inclusion reflexion, to share their point of view as beneficiaries of the projects. We also discovered the gastronomy from Asturias, traditional dances and cultural spots. Lastly, this seminar provided the chance for the partners to meet each other and discuss their future projects together. Networking plays an important role in EVS coordination, especially with inclusion projects.